Below are my first Shatisms using William Shatner’s brilliant new app: Shatoetry. 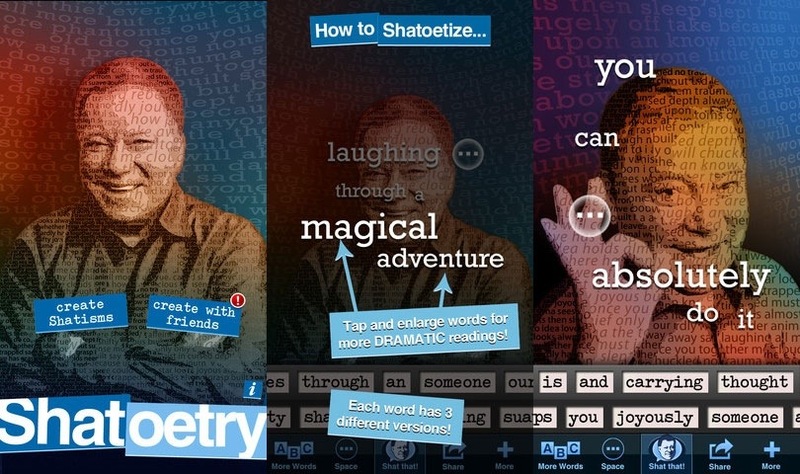 The app allows you to put words in Shatner’s mouth and have him recite them back to you. Dramatic pauses can be added between words, as well as three different variations on each word – with each one sounding more emotionally charged than the last. The current list of words is long enough to create some hysterical phrases and future app updates will include words packs for holidays and special occasions. The app also has a co-op mode, on and offline, where you and another “Shatoetist” can create a Shatism together. In addition to being able to download your creations, Shatoetry lets you share your Shatisms in a variety of ways, including: Facebook, Twitter, YouTube, and email. While it’s initially only available for iOS devices, an Android version is in the works.